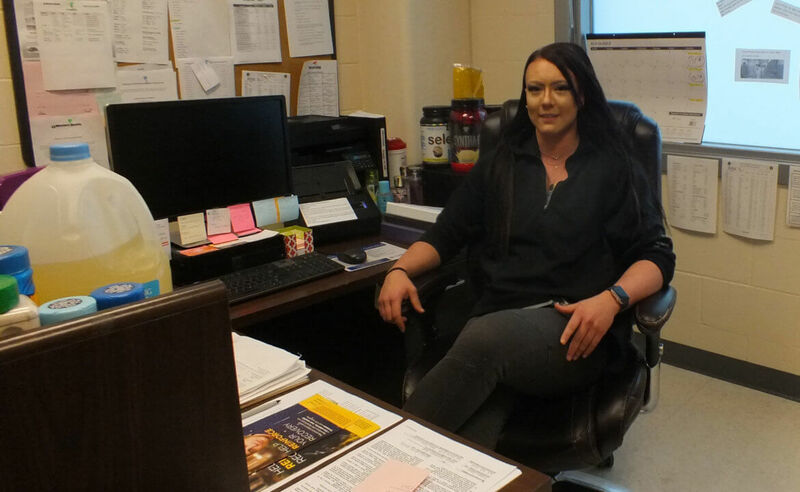 Ashley Adams, the nursing director for Pennsylvania’s Butler County jail, oversees a special unit that houses inmates with mental health issues in protective cells. For most of those in her care, it’s the only place where they will find treatment, she says. Photo by Eric Jankiewicz. As director of nursing at the health unit of Pennsylvania’s Butler County jail, Ashley Adams offers one of the few resources in the county for people suffering from disabling illnesses of the mind. She remembers one young man who was an inmate of the prison from August to December. “He didn’t belong here,” Adams said, explaining that he was originally a patient at Butler Memorial Hospital and suffered from a bipolar disorder and schizophrenia. The hospital couldn’t offer him long-term care and when they demanded he leave, the young man refused, prompting hospital officials to call the police. Adams said the man became so agitated by the time the police arrived that he hit the officers. He was eventually sentenced to a jail term for aggravated assault. Ten years after Butler County Prison was built, officials continue to look for ways to deal with inmates suffering from mental health issues, a task that isn’t inherent to a system tasked with punishment, not therapy. Adams, a health services administrator and registered nurse with the jail, said that these people could be suffering from a variety of conditions, from a mild anxiety disorder to a serious mental health diagnosis, such as bipolar disorder or schizophrenia. The problem is not specific to Butler, according to researchers and criminal justice experts. Nationally, mental illness affects men and women in jail at rates four to six times higher than in the general population. “In a mental health crisis, people are more likely to encounter police than get medical help,” according to one study by the National Alliance for Mental Health. In Butler, if an inmate suffering from a mental health issue becomes disruptive or aggressive, the most immediate response is to put him or her in cells specially designed for high visibility so that inmates can’t hurt themselves, said Beau Sneddon, the jail’s deputy warden of operations. “We have a lot of people here with mental health problems so that’s something we deal with regularly,” Sneddon said. “We’ve learned so much about what their needs are, and we’ve educated our corrections officers. But this does little for an inmate’s long-term recovery. Once they are no longer causing trouble, Adams said they have little choice other than putting them back in the jail’s general population or keeping them in the special cells. “These individuals often do not do well in the general population at the prison,” Adams wrote in an email, arguing that a special area for them be designated. She noted that with the jail’s inmate population currently at 259, there is enough space in a jail that has a capacity of more than 500 to create a dedicated space for people in the midst of a mental health crisis, something they do not have. Instead, the health unit has 10 cells that provide high visibility of the jailed inmate allowing jail attendants to ensure they don’t harm themselves. There are also three padded cells for special cases. “For humanitarian reasons we try to get them out of there as soon as possible,” she said, explaining that the padded cells aren’t outfitted for long-term use as they don’t have beds or a toilet. She continued, “My biggest goals for the mental health side of things would be an on-site provider as well as a greater capacity for housing inmates meeting mental health diagnosis criteria in a different setting than our medical infirmary. 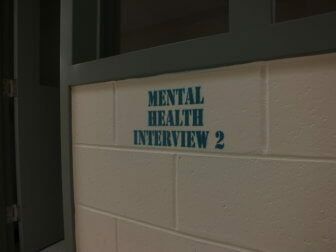 At least 2 million people with mental illnesses are booked into facilities like the Butler County jail each year. Photo by Eric Jankiewicz. Currently, she said, if an inmate who has been in a padded cell for a long time isn’t ready to be put in a high visibility cell then they will try and send him o a medical facility. A dedicated unit would remove a need for outside facilities. Last year, jail officials floated the idea of creating a crisis intervention center by repurposing an area of the prison known as the pit, that currently has just a few cells and a row of chairs. During a December meeting where Warden Joe DeMore mentioned the idea, the county’s commissioners appeared willing to consider such a move. But Travis Parker, a senior criminal justice expert with Policy Research Inc., based in Lincoln, Neb., said that jails are not the ultimate solution in treating mental illness. “Jail is not the place to get rehabilitation or services of any kind,” Parker said. He suggested instead that local police departments maintain local crisis response teams that include officers who are trained to deal with people who are suffering some kind of mental breakdown. Parker himself works part-time for a mobile crisis response team for law enforcement and jails in the 15 rural counties surrounding Lincoln, spending “a great deal of time” in counties not unlike Butler. He also suggested a regional triage center devoted to dealing with people who would be better served by treatment instead of jailing. “These units are intended to have law enforcement friendly policies where an officer drops somebody off and can leave the person at the center,” he said. Currently, Adams noted that incoming inmates to Butler County Prison are assessed and, if needed, referred to Cindy McCrea for help. McCrea works for Wexford Health Services, a third-party health care provider that specializes in jail health care. But this treatment is limited since the jail doesn’t have an on-site psychiatrist, Adams said. Instead, the jail offers webcam sessions with off-site doctors who can order psychiatric medication if needed, Adams said. Butler’s number of inmates is the lowest it has been in more than a decade. And in an attempt to reduce the number of jailed people suffering from mental health illnesses, Butler County’s legal structure offers three “specialty” courts that provide alternatives to jail. One of the courts, Behavioral Health Court, is designed for people with varying diagnoses of mental illness. Instead of being jailed they are given treatment and tools for rehabilitation and readjustment. But the program has its limitations. In total, 12 people have graduated from the Behavioral Health Court since 2015, when the program started. At the end of February another two will graduate, according to Erin McGarrity, who works with Adult Probation and Parole and is a Behavioral Health Court officer. Parker said that treatment courts can be helpful in preventing people from committing further crimes but they are limited by their ability to prevent people from turning to crime in the first place. Getting into Behavioral Health Court, which started in 2015, requires a defendant to apply for it, much like a job application. The process begins with a referral and then a court case manager with the specialty court will consult with McGarrity and the applicant to see if the defendant will be accepted. The requirements for Behavioral Health Court are numerous, including a willingness to accept the treatment. McGarrity said she understands criticism of the specialty courts not being accepting enough. “Sometimes, yes, the individual has a mental health illness issue, but the program is designed for those who have the highest risk, the highest need and the capability of being successful in the program,” McGarrity said. And alternatively, “Sometimes people are too sick and too mentally ill to meet the expectations of the program,” McGarrity said. Those who are accepted must plead guilty to a number of agreed upon charges. They are also put on a harsher plea deal that will be used if they fail out of the program. The District Attorney’s office must also agree to the deal. “It’s much harsher,” McGarrity said about the plea deals they have to accept if they fail out. McGarrity noted that the other two courts, Drug Treatment and Veterans, deal with defendants suffering from mental health issues, too. For Drug Treatment Court, which started in 2011, there are a total of 37 graduates. And in Veterans Court, which started in 2012, there are a total of 33 graduates. Adams hopes that, ultimately, inmates with serious mental health problems have some place other to go other than jails, noting that she is part of a countywide committee involved in “Stepping Up,” a national organization devoted to reducing the number of mentally ill people being put in jail. More than 425 counties, including Butler, have passed a resolution or proclamation to participate in the initiative, according to information provided by the organization. Participation allows counties to gain support from public and private entities and the initiative builds on the many innovative and proven practices being implemented across the country. “The challenge right now is having an appropriate place to divert them to — such as forensic beds in hospitals, psychiatric hospitals/treatment centers and long-term structured rehab type settings,” she wrote in an email. Eric Jankiewicz, a former Crime Report news intern, is a staff writer for the Butler Eagle and a 2018 Rural Justice Reporting Fellow. This is a condensed and slightly edited version of the second in an occasional series of articles on the county jail. The complete version, by subscription only, is available here.